Restyle is a porcelain floor tile, wood inspired, each slab is unique and different from the other, creating a marked colour shading on the surface, it's dynamic and original. 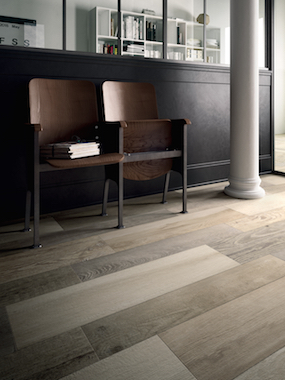 Refined details and slightly glossy effects evoke the ravages of time and give character to the floor. A rectified pale wood effect in 2 different widths and 2 different slip resistant finishes on the larger plank, makes this porcelain floor tile range amazing for use inside or outside!! Very variegated means that it is a V4 rating for colour shade variation (see our advice sheet). It is also an R9 slip resistance rating or R11 rating option on the larger plank (see our advice sheet).